The staff at the Virginia Cartilage Center have created a novel exercise program, the object of which is to optimize joint mechanics and reduce stress concentrations by understanding and controlling stress vectors. The program is designed for patients with cartilage damage and osteoarthritis of the knee and incorporates weight-bearing exercises focused on tri-planar control of the foot and hip to promote proper alignment of the knee. Proper alignment is continually stressed in standing, walking, occasionally running as well as transfers from sitting to standing and stair climbing. Emphasis is placed on motor control in the performance of the exercises rather than high repetition endurance training or overload strength training. Exercises are performed without footwear and in view of mirrors for visual feedback. Kinesthetic awareness is promoted by verbal cuing and manual correction in activity performance. Concurrent clinical research using this novel exercise approach has generated outcomes of improved knee joint alignment in stance, walking, and on stairs in as little as six weeks of training. Patients report “awareness of how to use the knee” as well as decreased symptoms of pain and improved function. Vector analysis is the key to the development of the Richmond Vector Training Program. Understanding vector patterns and their control is the core of the program. It is through this neuromuscular training that we believe cartilage stress concentration is minimized and cartilage preservation is maximized. The labs at Biomotion offer three-dimensional computerized Motion Analysis to evaluate forces that move through the body. In addition to being used in academic kinesiology labs, computerized motion capture systems are used to create video-games and motion pictures. With this technology, very refined determinations of normal and abnormal motion patterns can be ascertained. Combining state-of-the-art equipment, software, and clinical expertise, our lab provides precise measurements and descriptions of an individual’s walking, running and movement patterns. Kinematics: motion of each joint in the sagittal, frontal and transverse planes. Kinetics: forces of the individual muscles acting at each joint in the sagittal, frontal and transverse planes. Kinetics are comprised of ground reaction forces, center of pressures, joint moments and joint powers. As part of the Virginia Cartilage Center, the motion analysis lab is able to provide individuals with pre and post treatment data about their biomechanical alignment during functional activities such as walking and ascending and descending stairs. We are able to measure changes in hip and knee alignment, changes in speed of motion, and alterations in forces that are generated at each individual joint. Shear forces are a focus of research at our lab. The Richmond Vector Training Program is a series of exercise-like movements that the therapists, kinesiologists and engineers have developed as part of a program to minimize cartilage stress at the knee. Our data suggests that by altering the biomechanical alignment and improving core motor control, individuals can have a reduction in knee pain and increased functional improvement in their quality of life. Training principles incorporated into the training program involve control of force vectors acting on the knee creating compression, tension and particularly shear. Control of forces acting on the knee can be influenced by local contraction of muscles crossing the knee joint, but also influenced by the support and alignment afforded by the hip and foot/ankle complex in the kinetic chain. Instruction is given in control of force vector direction and magnitude through balance and lower quarter neuro-muscular retraining in three planes of motion. Lower quarter alignment strategies are a focus of training in sit-to-stand transfers, gait, stair climbing as well as sport. Training optimizes the elasticity and potential energy stored in biologic tissues that can be directed toward more efficient human movement. The grid is a training aid used by patients in the Richmond Vector Training Program to better visualize movement patterns performed in three planes of motion. 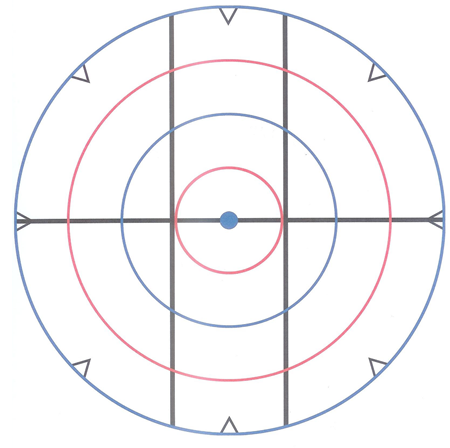 The central solid blue circle serves as an alignment point to begin varied movement patterns as well as an axis of motion for movement in the transverse plane. Parallel “vertical” bars serve as the “railroad tracks” for movement in the sagittal plane. The single horizontal line allows patients to track motion through the frontal plane. Multi-colored concentric circles function as targets for multi-plane reaching patterns for both upper and lower extremities. These circles also offer quick patient recognition for improvement in controlled displacement in defined vectors. The triangles along the outer green circle are visualized as numbers on a clock face situated at “12-6”, “10-4”, “8-2 o’clock” and the intersection of the horizontal line at “3-9 o’clock”. The identification of these clock face numbers serves as a method of communication between patient and instructor for initiation of movement in cardinal planes as well as diagonal vectors from a stationary central starting point. Functional screening tests serve to assess participants’ range of motion, flexibility, strength, balance, endurance, motor control, and tolerance to impact loading. Participants are evaluated in performance of functional screening tests on their initial visit and re-evaluated after six weeks of exercise. Grading of functional screen performance serves as a measure to evaluate improvement as well as to define deficiencies that serve as a basis for follow-up exercise training. The Five Functional Screening Tests include single leg stance, warrior II, hip hinge, full squat, and bench skip. The screening tests are preceded by an easy warm-up for the lower extremities such as stationary bicycling. Each exercise is performed bare-foot and four of the five screens utilize a weighted bar (4 lbs.) to counter-balance and facilitate erect trunk posture. While standing in stride barefoot with the right foot behind the left; engage the core muscles by tightening the trunk and hip muscles as though preparing to “take a punch in the stomach”. Drag the right foot forward with pressure on the ball of the right foot; when the right foot parallels the left foot lift the right knee to the front to a height creating a 90 degree angle at the right hip and knee. Hold the position for 30 seconds attempting to make the trunk “as tall as possible” slightly elevating the bar held across the back of the shoulders. Return to double leg stance and repeat the sequence with the left foot in stride behind the right. From a foot parallel stance, step out to the left at a distance wider than shoulder width turning the left foot 90 degrees to the left. Maintain the hips and shoulders directed forward as in the original parallel stance while engaging the trunk and hip muscles as if “taking a punch”. With the left kneecap directed over and not exceeding the second toe of the left foot, slowly bent the left knee “covering the left toes from sight”. Hold the position for 30 seconds and/or alternately bend and straighten the left knee, if holding the posture is uncomfortable. Return to parallel stance and repeat to the right turning the right foot out to 90 degrees beyond shoulder width. Standing in a parallel stance with a bar at arm’s length across your thighs facing “12 o’clock” on an imaginary clockface where “6 o’clock” is directly behind; engage the trunk and hip muscles as though “taking a punch”. Balance of the left foot while bending forward lowering the bar toward the floor raising the right foot toward “6 o’clock” behind. Reach with the right foot toward “4 o’clock, up to 6 o’clock, and behind the left leg to 8 o’clock”. Return the right foot to “6 o’clock” then back to the floor while returning to an upright parallel stance. Standing in parallel stance with a bar at arms length across the thighs; engage the trunk and hip muscles as though “taking a punch”. Extend the bar as far forward as possible while extending the hips as far back as possible over the heels as though attempting to sit in a chair. Continue the descent as far as can be controlled without knee pain, hold the bottom position for 2 seconds, return to standing while maintaining a “hips as far back as possible” posture. Standing with the left foot atop a 4” step and the right foot on the floor; engage the trunk and hip muscles as though preparing to “take a punch”. Jump vertically into the air pushing off both feet changing foot positions in the air so as to land softly with the right foot atop the 4” step and the left foot on the floor. Immediately repeat the vertical jump off both feet while alternating foot positions as though “landing on hot coals”. Repeat the jump cycles until the left foot lands atop the step for 10 repetitions. The Vector Training Program uses minimal training equipment with minimal training time enhancing patient compliance for program use in home exercise.